The Sports Connection has over 100 Games & Rides to guarantee your child's birthday party will be Full of Fun and Excitement! 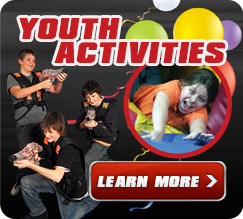 The Games & Rides party option allows kids to play any game or ride in our huge arcade room. There are no restrictions on which games or rides to play and any redemption tickets won can be redeemed at the redemption counter.Parties choosing the Games & Rides options, as one of their Attractions, will receive a $10 Game/Ride card per paying participant for each 30-minute Attraction block. For example, if you choose 30 minutes of Games & Rides, each participant will receive a $10 Game/Ride card. If you choose 60 minutes of Games & Rides, each participant will receive a $20 Game/Ride card. If you choose all 90 minutes to be Games & Rides, each participant will receive a $30 Game/Ride card. The Connection Credit Card is your key to cashless FUN and FOOD! All Sports Connection Games & Rides are activated by the Connection Credit Card. No more tokens and paper tickets! You can easily add more value to your card at any of our kiosks, recharge stations or front counters. No need to carry money or tokens around all day, attach your card to a lanyard or key chain for easy storage. Ticket value is AUTOMATICALLY added to your Connection Credit Card after you are done playing your game! Once you are done playing, go on a shopping spree at our Toy and Prize Redemption Counter. All Participants Must Bring A Signed Sports Connection Waiver With Them To The Party. Waivers Are Included With The Sports Connection Invitations.